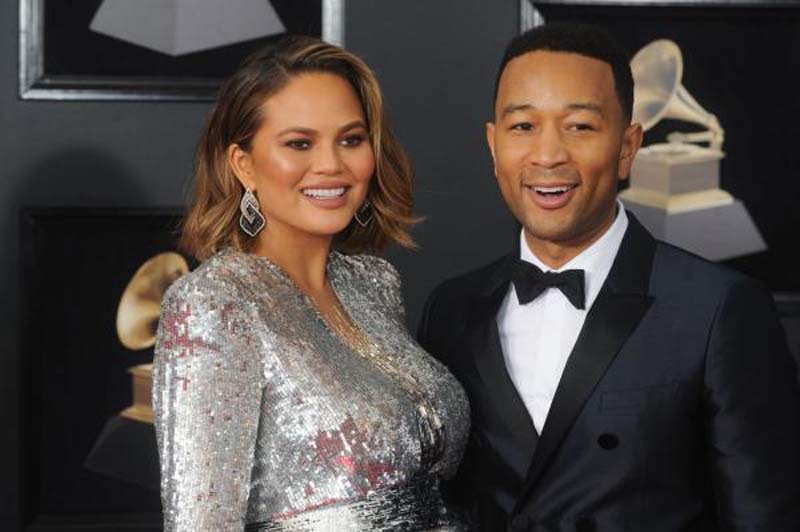 Chrissy Teigen announced on Instagram the name of her newborn son she shares with husband John Legend, alongside the first photo released of the baby. "Hello, world! This is Miles Theodore Stephens - We are drowning in his little peeps and nuzzles," Teigen wrote Sunday to caption the image that features the newborn resting. "Our household feels overwhelmed with love. Thank you for all your well wishes!" Teigen and Legend, real name John Roger Stephens, announced the birth of Miles on Thursday. The couple, who tied the knot in 2013, are already parents to 2-year-old daughter Luna. Teigen, 32, previously told Us Weekly she's willing to have a third child due to how supportive Legend, 39, has been during her pregnancies. "He holds my belly at night, sings to it, wants to be there for me," she said. "I'm really lucky because some men start to look at you like a tool, I've heard, so I've been scared and don't let that happen to me! But it hasn't and it's really good."